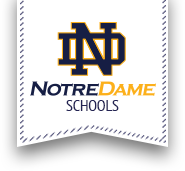 Notre Dame High School’s basketball teams will be taking to the court for the January 12th match-up with Whitesboro looking to score, not only a home victory, but also some additional support for the American Cancer Society’s efforts to fight the disease. The school will be holding their second Coaches Vs Cancer game, which is a national effort by high school and collegiate coaches to raise awareness and funds to further research, education, advocacy and patient service programs through the American Cancer Society. The teams and coaches will be wearing special ‘Coaches Vs Cancer’ t-shirts, as well as selling ‘Wall of Hope’ cards prior to the game – where supporters will recognize someone they know who has battled cancer, - then have those names displayed on the gym wall before the game as a tribute to them. The girls’ game takes place at 5:30 PM with the boys’ game at 7 PM on Tuesday, January 12th at Notre Dame High School.